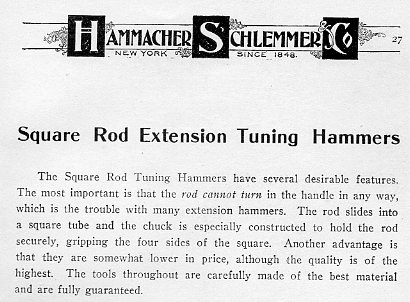 I never saw a Mueller hammer with an aluminum handle, but it is interesting to see that alternative materials were advanced to production, even back in 1903. 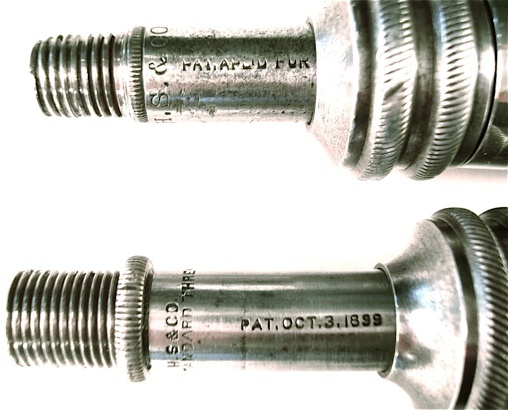 The locking nut which compresses the collet to secure the adjustable shaft was not a new idea. 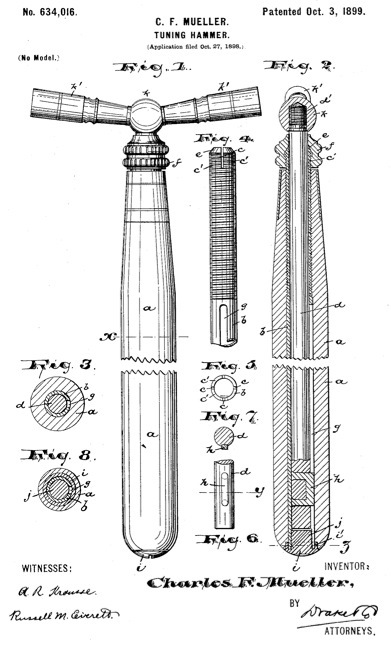 That idea was introduced by Francis Hale in 1885. 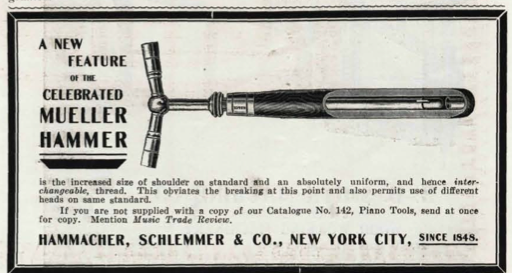 1903 advertisement from the “Musical Merchandise Review,” introduction of the New Standard Thread. 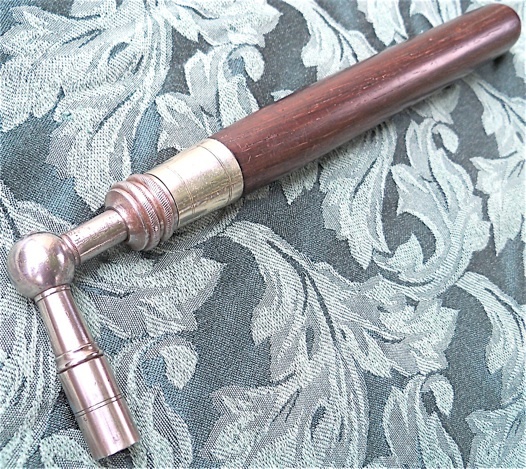 Mueller hammer made in 1898–99, “patent apl’d for”. With “E. (Erlandsen) Manufacturing Co.” engraved on the tip. 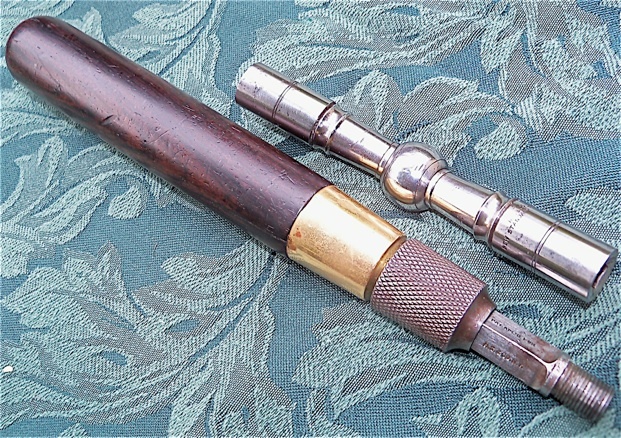 A comparison of the 1898-1899 Mueller and the post-1903 Mueller with “New Standard Thread”. Both have a straight, and not tapered, thread with a friction mating/locking surface. 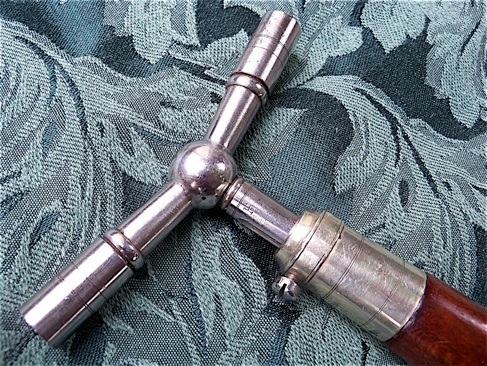 The earlier version has a smaller diameter thread compatible with other Erlandsen hammers, and the later thread has a larger diameter, almost as large as the diameter of the shaft itself. A locking ring has been added to provide a secure fit. 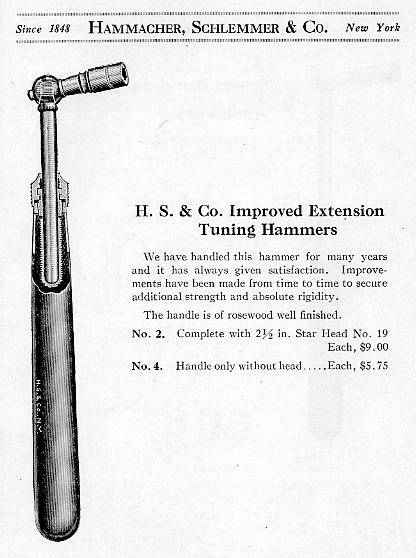 H. S. Catalogue 1918, with optional fibre covering on handle. Music Trades Review, August 3, 1918. 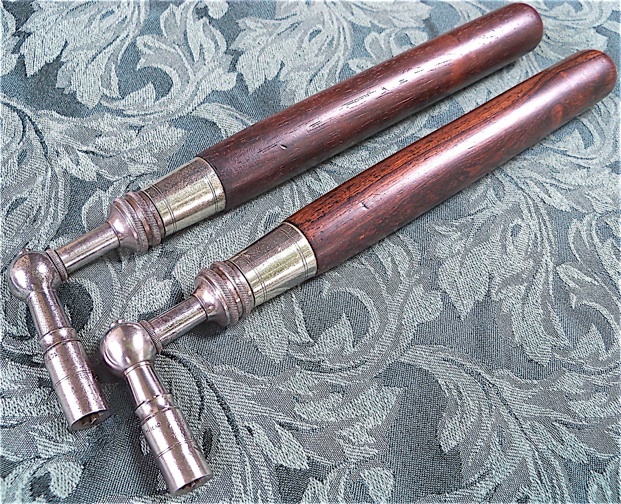 Three Mueller ‘Improved’ Extension Tuning Hammers. These were made around the WW1 era, and through the 1930s; the one on the bottom is an earlier version, the same as the illustration in the article above. Historical inaccuracies were common in the U.S. trade catalogues, even when it pertained to their own history. Apparently there were/are no history majors on staff! 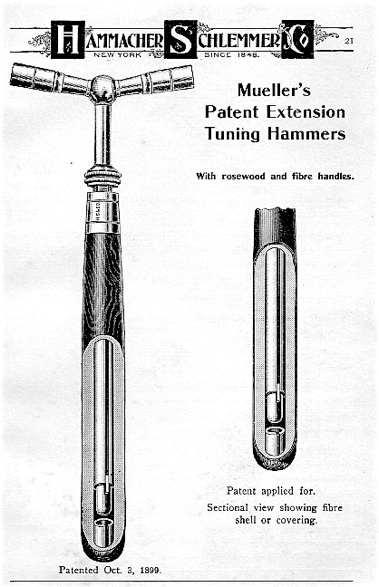 Here is the hammer in the 1925 catalogue. 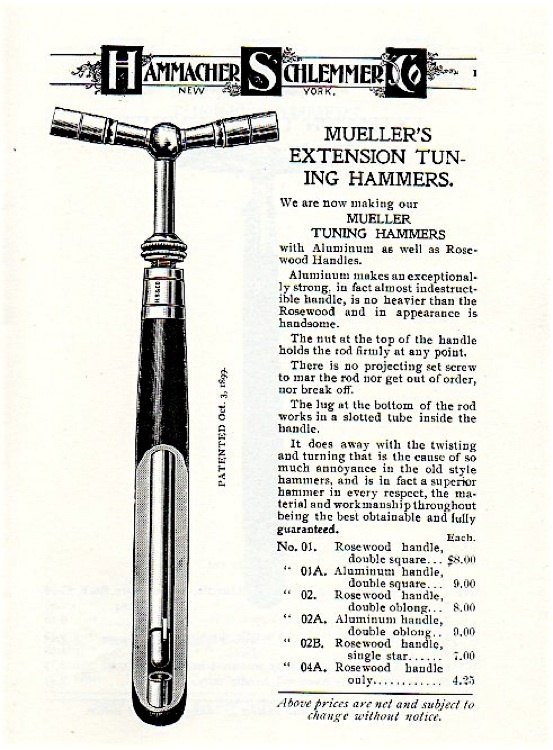 The reference to Mueller was omitted, which made sense, because it was not very similar to the classic original Mueller hammer. The square shaft never rotates. 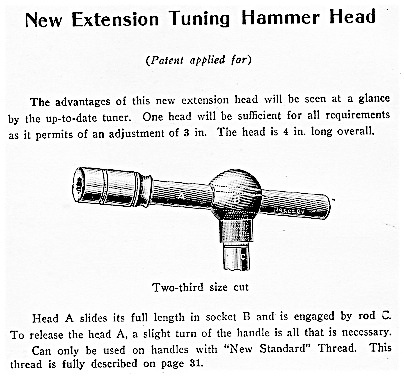 I’ve not seen this in other tuning hammers; it works. 1918 H.S. catalogue. 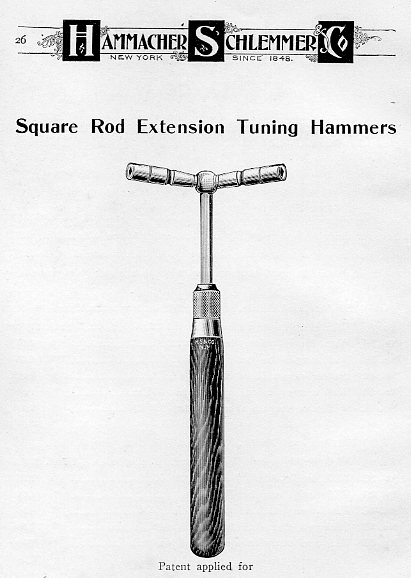 H. S. tuning hammer, short version, with square shaft, “patent pending,” and New Standard Thread. 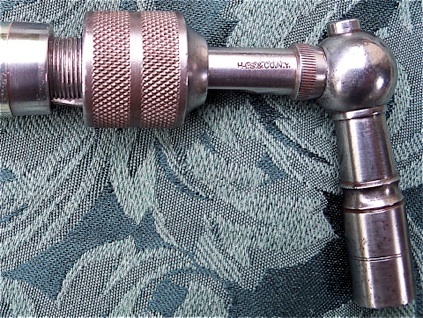 Adjustable tuning hammer head for H. S. hammers with “New Standard “ thread, c. 1918.